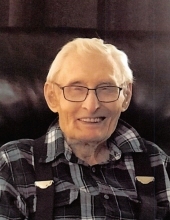 Alvin Hamann, age 102, of Clear Lake, SD passed away on Friday, January 11, 2019 at the Sanford Clear Lake Medical Center. Funeral service will be at 2:00pm on Saturday, January 19th at St. Paul’s Lutheran Church in Clear Lake. Visitation will be 5 to 7pm on Friday, January 18th at the Houseman Funeral Home in Clear Lake. Visitation will resume one hour prior to the service at the church. Burial will be at the Lakeview Cemetery in Clear Lake. Houseman Funeral Home of Clear Lake is entrusted with the arrangements. Alvin August Hamann was born in Clear Lake, South Dakota on March 5, 1916 to parents Rudolph and Amelia (Winterfeld) Hamann. He was the oldest of his six siblings. Being raised in a German household Alvin had to learn English when he started school in Clear Lake. During WWII Alvin tried to enlist but due to medical reasons was rejected. He drove a school route with a horse and wagon and also worked on a grain shocking crew. He has also worked for Farmers Union Oil Co. and drove truck for Wiswall Trucking. Farming was Alvin’s true calling, he farmed the earth and raised crops and livestock, from a dairy herd, cow/calf operation, feeder cattle, farrow to finish hogs, sheep and chickens all at the same time and did custom farm work as well. On November 23, 1947 Alvin was united in marriage to Maroa Olson and to this union they were blessed with three sons and a daughter. They raised their family on the Hamann family farm west of Clear Lake. Maroa died at the age of 59 on September 19, 1984. On December 31, 1988 Alvin married Larraine (Johnson) Dumke. Larraine died on February 16, 2014. Alvin enjoyed house parties in his youth where he would play his steel guitar, attending dances at Tuner Ville and car races in Estelline. He also enjoyed playing cards, shooting pool, hunting and fishing and square dancing. In later years he found restoring old tractors to be an interesting hobby. Alvin was a life long member of St. Paul’s Lutheran Church where his parents were founding members and he taught Sunday school. Held the longest membership in the National Farmers Organization. Long time board member of the Ivanhoe NFO Livestock Collection Point. Alvin is survived by his children: Eugene Hamann, Clear Lake, Julius (Jody) Hamann, Montevideo, MN and Irene Hamann, Las Vegas, NV; two step-children: Cheryl (Jerry) Linder, Bloomington, MN and Garry (special friend, Eloise Redlin) Dumke, Clear Lake; nine grandchildren, ten great-grandchildren and numerous step-grandchildren and great-grandchildren; one brother, Herbert (Bev) Hamann, Clear Lake and one sister, Hilda Faber and numerous nieces, nephews, cousins and friends. He is preceded in death by his parents; two wives, Maroa and Larraine; three brothers, Marvin, Albert “Bud” and Donald Hamann and one sister, Velma Pemberton; one son, Lonnie Hamann. To plant a tree in memory of Alvin August Hamann, please visit our Tribute Store. Visitation will be 5 to 7pm on Friday, January 18th at the Houseman Funeral Home in Clear Lake. Visitation will resume one hour prior to the service at the church. "Email Address" would like to share the life celebration of Alvin August Hamann. Click on the "link" to go to share a favorite memory or leave a condolence message for the family.